Company intranet software is one of the most powerful tools on the market for modern businesses. It's gaining traction at an impressive rate. When properly used, it can streamline all of your businesses processes, keeping you and your employees on task at all times. It eliminates many of the stressful aspects of the workday. As with any type of application, your intranet shouldn't be expected to run at peak level without any human intervention. There are many techniques you can employ to get the most out of it. With the right approach, you'll be one step closer to taking your business to an new level. Below, you'll find 15 essential tips for making intranet software more beneficial to your business. Start with these, but don't hesitate to get creative and expand upon these suggestions. 1. Don't Rush Your Vendor Search. If you're just now looking to purchase intranet software, chances are you've seen all the different options out there. The amount of choices you're confronted with can result in information overload. This often causes many people to rush into choosing a platform because they don't know where to turn. Rushing your search for an intranet software vendor is one of the biggest mistakes you can make. Not all options are created equal. Take the time to determine what the needs of your business are. And compare at least a few different platforms before making a decision. 2. Plan Your Intranet Launch Carefully. It can seem as if shopping for company intranet software is the most difficult aspect of the process, but many people forget how much work goes into planning the software's launch. You can't deploy a piece of software without thinking things through — too much can go wrong. 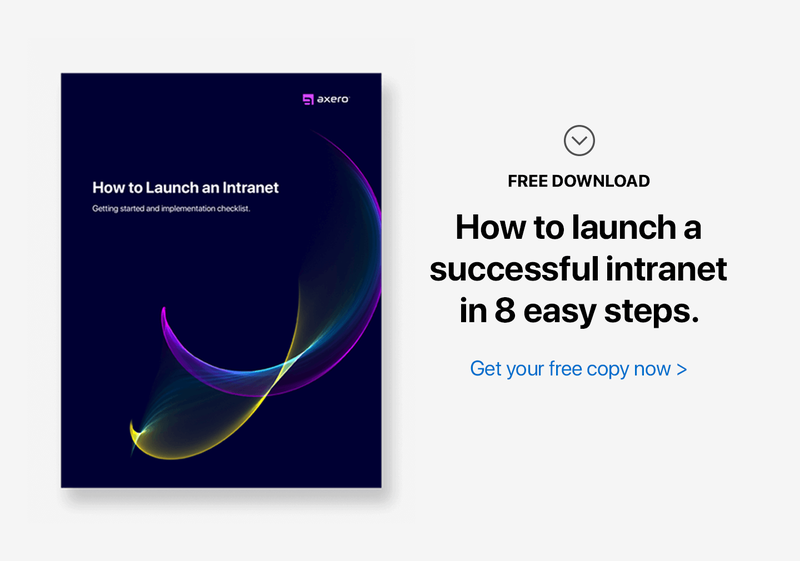 Your intranet launch should be planned out, just as you might plan a strategic marketing campaign. Perhaps the most important thing to remember is to allow yourself enough time to get things off the ground. Launching your intranet may seem like a pressing issue, but you'll run into less problems if you take your time and think it through. There are many benefits to using intranet software. Even still, you'll have a hard time getting the most out of it if you don't set clear goals for your organization at the very beginning. Setting goals not only keeps you on track, but ensures the results you achieve are identifiable. Note that setting too many goals for your organization can be overwhelming and lead to frustration — keep things reasonable and achievable. 4. Clarify User and Intranet Roles & Responsibilies. When people use your social intranet, it may be difficult for them to recognize what their actual roles within the community are. There's no room for gray area when it comes to setting intranet roles and responsibilities, you need to have a core group of people to lead and manage your intranet. You can help clarify roles by setting specific permissions for each employee, which either allow or disallow access to certain spaces or features within your intranet. A major perk of an employee intranet is that it allows your people to take the reins and run with any ideas they might have. Naturally, some people will be more proactive than others, contributing content, knowledge and suggestions to help improve the intranet as a whole. These employees can and should be recognized as "power users" ... staff who serve a crucial role in your organization. Identifying power users and encouraging them to continue working towards complete involvement in your intranet has its benefits, and it takes little more than paying attention to daily happenings in your virtual space. 6. Keep Your User Interface Clean and Minimalist in Design. A poorly-designed user interface will make or break your intranet success. You could have the most feature-rich software, but it'll be useless if your employees can't properly navigate it. Keeping things clean and minimalist in design is essential to creating a successful intranet. This is just one more reason to avoid "one-size-fits-all" social intranet software, as these types of options don't allow for the customization you might need. 7. Integrate Your Business Processes. Any successful business will incorporate daily processes into their intranet. They'll make it the go to spot for your employees to access information, communicate with others, and find the knowledge they need to do their job. Well-designed intranet software allows you to incorporate your current business processes so that everything is located in a single space, eliminating the need for your people to have to log into 5 different platforms. 8. Give Each Team its Own Workspace. With social intranet software, you can create specific online workspaces for each team in your organization. This allows you to organize content, files and discussions so that nothing overlaps and leads to an excess of information. Teams can still collaborate with each other, but having the option to keep things in a private space can come in handy. 9. Call Upon Customer Support When Needed. If you run into a problem and can't find the solution, remember there's no shame in calling your intranet vendor and asking for guidance. Customer service is part of what you're paying for, so use it to your advantage. Make sure you find a reputable vendor that provides great intranet support. 10. Schedule a Training Session. Social intranet software is designed to be easy to use. But it's important to explain to your employees why they should be using the intranet. You need to show them the value. Scheduling an intranet training session is one of the best ways to make sure your employees know exactly how to use it. The earlier you can tackle this, the better. Make yourself available at all times to answer questions or concerns. Intranets are an excellent platform for empowering your employees. This type of software lets employees speak up, contribute their own ideas and knowledge, and offer suggestions. This type of activity should be encouraged. Employee empowerment can lead to increased productivity and better workflow. 12. Put Together a Content Creation Schedule. Content marketing is becoming more and more important to the modern business landscape. Intranet software features a robust content creation system, letting you push out blogs and wikis that can be used either for internal or external purposes (or both). You can take advantage of this feature by putting together a well-organized schedule for content creation, delegating tasks to specific employees and opening cases within the community to track their progress. Whether you're working to build an internal knowledge base or are simply trying to drive traffic to your site with blog posts, you're going to need a coherent schedule to keep you and your employees on task. Keeping track of meetings and events in today's busy world is more difficult than ever, and you and your staff can use all the help you can get. Social intranet software allows you to share your calendars with other members of your organization so that everyone is on the same page in terms of when events are scheduled and when you yourself are tied-up. You can also get a lot of mileage out of using a personal, private intranet calendar to stay on top of your own responsibilities — sharing will only help increase transparency. 14. Stress the Importance of Notifications. Since social intranet software can replace email in many ways, it's essential that you and your staff make good use of notifications. You can customize and set notifications to meet your specific needs, which can then be sent to your email address in case you aren't currently logged into the community. In this way, your email inbox becomes more of a notification center than anything else, creating a new way to keep up with daily tasks. 15. Take a Moment to Review Progress. After you and your staff have been using intranet software for a period of time, it can be helpful to check-in and review the progress that has been made. You've already got a list of goals you created before getting things off the ground, which can serve as an excellent signpost for the progress you've made thus far. If things are going smoothly, you can think of how to keep the progress moving. If you're not meeting your goals, however, this is the time to consider how you can improve upon your intranet utilization. Social intranet software may be powerful, but you'll get even more out of it if you put in a little work. Develop a plan, put it into action, and the rest will write itself.